Gold fell $8.20 or 0.93% yesterday, closing at $1,327.80/oz. Silver dropped $0.05 or 0.23%, closing at $21.72. Platinum fell $12.04 or 0.9% to $1,401.06/oz, while palladium slipped $6.25 or 0.9% to $721.75/oz. 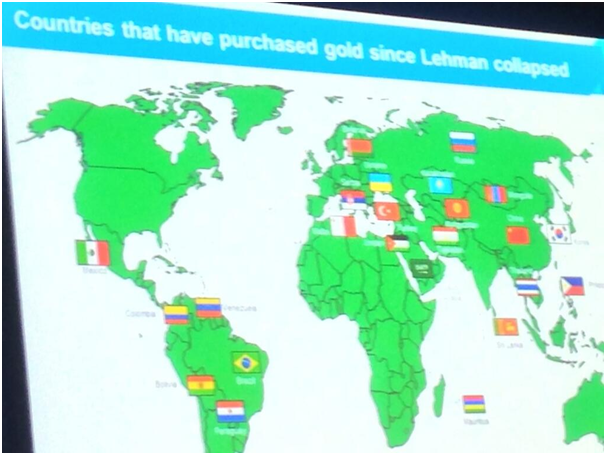 The LBMA conference heard from participants that emerging market central banks, with large foreign exchange reserves, are likely to continue diversifying into gold and remain net buyers of gold in the coming years. Gold edged upward as the first U.S. government shutdown in 17 years began, increasing safe haven demand to protect wealth on concerns that a prolonged impasse will impact the U.S. economic recovery. The yellow metal gained almost 8% for the third quarter, thanks to a sharp rebound rally following a record 23% drop in Q1 where it posted a $225 two-day drop in mid April. It was also gold's first quarterly rise since the third quarter of 2012. Central Banks have long been buyers of gold bullion and there was a marked increase in central bank bullion activity post the Lehman collapse. Central banks bought 534.6 tons of gold in 2012, the most since 1964, and continue to accumulate. At the London Bullion Market Association conference in Italy, an official from Banca d'Italia said that keeping gold reserves is a key support to central banks' independence, squashing rumors that it might sell some of its holdings. Mike O’Brien is the Director of Litigation Technology at Freeborn & Peters LLP. He is responsible for creating, implementing and managing the firm's litigation support strategy and solution set. He can be reached at mobrien@freebornpeters.com.